Hen and ChickensEvergreen perennial. Broad blue-grey leaf rosettes have pink edges. 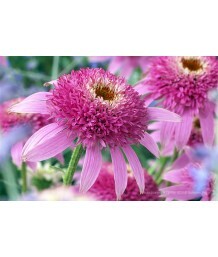 Spreads gently t..
ConeflowerDeciduous perennial. Part of the Big Sky series. 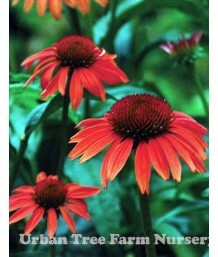 Strappy dark green leaves form low foliag..
ConeflowerDeciduous perennial. Strappy dark green leaves form low foliage clumps. 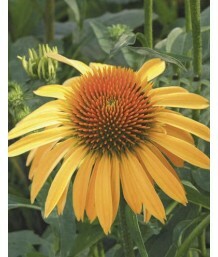 Through the summer..
ConeflowerDeciduous perennial. Part of the Cone-fections series. 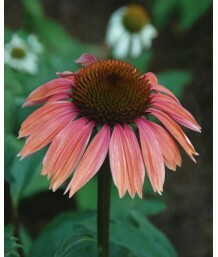 Strappy dark green leaves form low ..
ConeflowerDeciduous perennial. Part of the Cone-fection series. Strappy dark green leaves form low f..
Fairy WingsEvergreen perennial. Wonderful groundcover. Glossy bronze new foliage ages to green. Divi..
Bishop's HatDeciduous perennial. Wonderful groundcover. 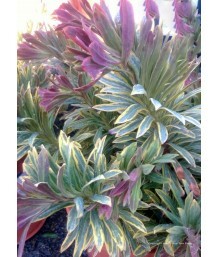 Glossy bronze new foliage emerges in spring ..
Bishop's HatDeciduous perennial. Dense, spreading mounds of bright green, heart-shaped leaves. Brigh..
Bishop's HatEvergreen perennial. Wonderful groundcover. Glossy bronze new foliage ages to green. Div..
BarrenwortDeciduous perennial. Wonderful groundcover. 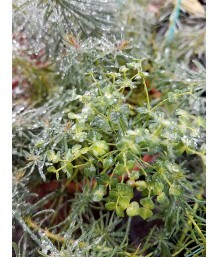 Glossy bronze new foliage emerges in spring to..
Miniature Horsetail RushEvergreen shrub. Miniature version of the common horsetail with a spreading ..
South African HeatherEvergreen perennial. Stiffly upright branches with soft, dark green foliage. 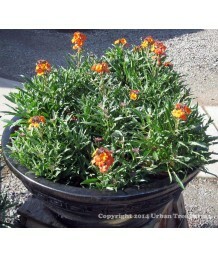 De..
Santa Barbara Daisy/Mexican DaisyEvergreen perennial. 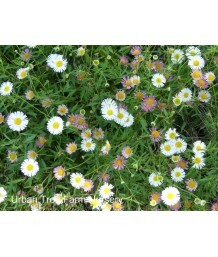 Mounds of fine textured leaves topped with dai..
Seaside Daisy/Beach AsterEvergreen perennial. 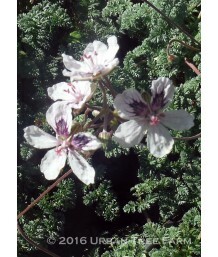 A California native hybrid of E. glaucus. 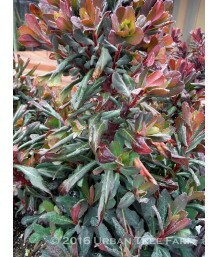 More compact..
Red BuckwheatEvergreen perennial. CA native. Narrow gray leaves make a low, wide foliage mound. 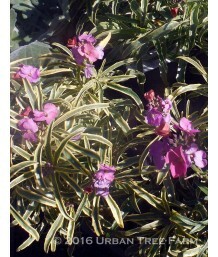 Summ..
Coast/Seaside BuckwheatEvergreen perennial. Forms neat mounds of silvery white foliage. 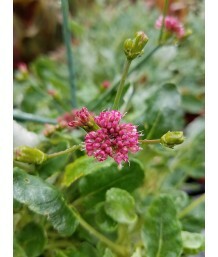 Pinkish-whit..
Sulpher Flower BuckwheatEvergreen perennial. CA native. 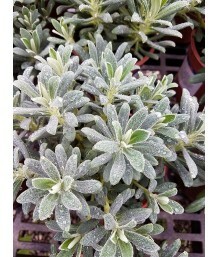 Gray-green leaves form a dense, low groundco..
Sulpher Flower BuckwheatEvergreen perennial. CA native. Gray-green leaves form a dense low cushion. .. Dwarf HeronsbillEvergreen perennial. 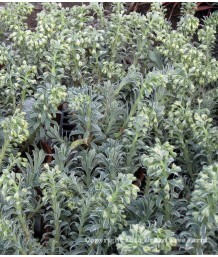 Grey-green crinkled leaves form a tidy low foliage mound. 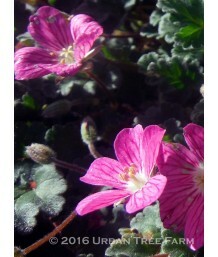 Rosy-..
Cranesbill/Heron's BillEvergreen perennial. 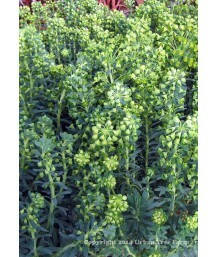 Grey-green crinkled leaves form a tidy low foliage mound..
False Sea HollyEvergreen perennial. Dark green, 3"- 4" long, prickly leaves form a low mound. Long, .. Dwarf False Sea HollyEvergreen perennial. 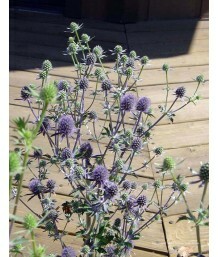 Dark green, 3"- 4" long, prickly leaves form a compact pla.. Dwarf Turish WallflowerEvergreen perennial. Used as groundcover. 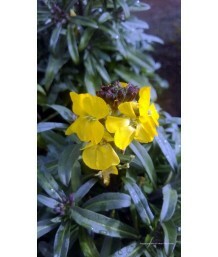 Hardier than other wallflowers. Low..
Sissinghurst WallflowerEvergreen perennial. 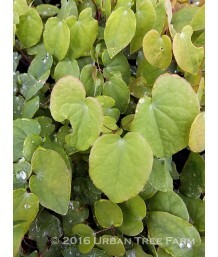 Slender variegated green leaves with yellow edges cover ..
Coast WallflowerEvergreen perennial. CA native. Slender green leaves cover this many branched shrubb..
WallflowerEvergreen perennial. Slender green leaves cover this many branched shrubby perennial. Clus..
Variegated WallflowerEvergreen perennial. Slender green and cream-edged leaves cover this many branc..
WallflowerEvergreen perennial. 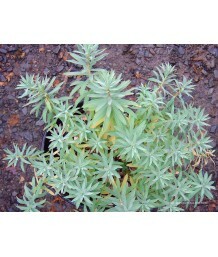 Slender green leaves with yellow edging cover this many branched shru..
California PoppyDeciduous perennial. California native State Flower. Finely divided, fern-like blue ..
White SnakerootDeciduous perennial. Rich purple-brown leaves form bold clumps of foliage. Fluffy whi..
Evergreen SpurgeDeciduous perennial. Red edges highlight the long narrow green leaves. Cream mid-rib..
Wood SpurgeEvergreen perennial. Red-orange new leaves mature to fleshy deep green on this tough rela..
Wood SpurgeEvergreen perennial. 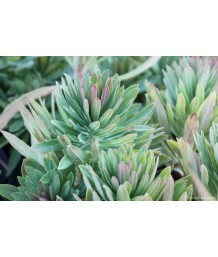 Lightly variegated leaves with a slight pink blush give this tough p..
Wood SpurgeEvergreen perennial. Fleshy deep green leaves are heavily tinged with purple on this toug..
Wood SpurgeEvergreen perennial. Grassy green leaves stand erect in whorls on this gently spreading f..
Wood SpurgeEvergreen perennial. 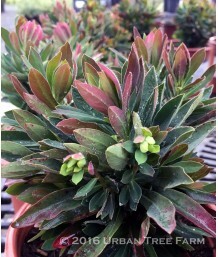 Fleshy deep green leaves are heavily tinged with bronzy maroon on th..
SpurgeEvergreen perennial. Bright green fleshy leaves create a billowy habit on this tough relative ..
Evergreen SpurgeEvergreen perennial. Fleshy green leaves have an almost velvet look on this tough re..
Evergreen SpurgeEvergreen perennial. Fleshy, blue-green leaves edged with cream variegation on this ..
Evergreen SpurgeEvergreen perennial. 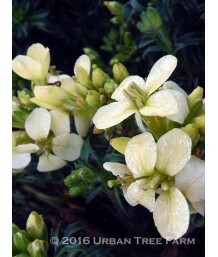 Fleshy, grey-green leaves edged with creamy yellow variegation ..
Mediterranean SpurgeEvergreen perennial. 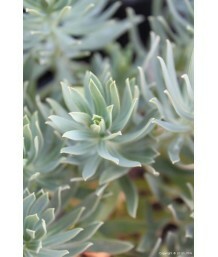 Fleshy blue-grey leaves are held somewhat erect on this tou..
Evergreen SpurgeEvergreen perennial. Fleshy blue-grey leaves are held somewhat erect on this tough r..
Cypress SpurgeDeciduous perennial. Almost ferny, pointed soft green leaves form a relatively low mat..
Purple SpurgeDeciduous perennial. Burgundy new leaves mature to fleshy deep bronzy green. Tough rela..
Griffith's SpurgeDeciduous perennial. Orange new growth matures to olive green leaves on this gently..
Myrtle SpurgeEvergreen perennial. Blue-gray green somewhat triangle shaped leaved radiate around lon..
Blue Haze SpurgeEvergreen perennial. Narrow, chalky-green fleshy leaves provide extra interest. Toug..
SpurgeDeciduous perennial. Blue-green narrow needle-shaped leaves add great texture to the garden. T.. Cushion SpurgeDeciduous perennial. Leaves emerge green in spring with the top growth quickly turning.. Cushion SpurgeDeciduous perennial. Lightly variegated leaves with a slight pink blush give extra int..
Sikkim SpurgeDeciduous perennial. New stems are a bright red on this gently spreading form. 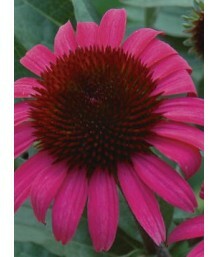 Bright g..
Blackbird SpurgeEvergreen perennial. 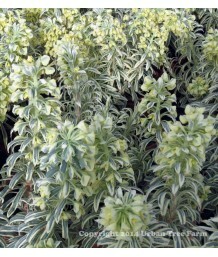 Also known as Euphorbia nothowlee. Fleshy deep purple leaves ha..
Diamond Frost SpurgeEvergreen perennial. Bright apple green, soft, delicate leaves. 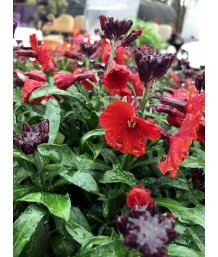 Tiny but profuse..
Red Wing SpurgeEvergreen perennial. Dark green leaves have hints of purple. 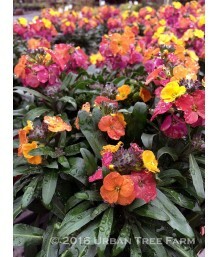 Leaves turn red in colde..
Ascot Rainbow SpurgeEvergreen perennial. 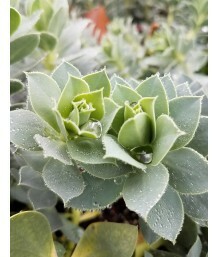 Leaves are a colorful mix of blue-green, creamy yellow, and..
Martin's SpurgeEvergreen perennial. Dark green leaves most of the year. In cold weather, bold red le.. Cushion SpurgeEvergreen perennial. Dark green leaves have hints of purple on this compact form of Eu..
Martin's SpurgeEvergreen perennial. Dark green leaves have hints of purple. Leaves turn red in colde..